In a sudden phone call last night, I was asked to speak Kazakh today in some sort of konkurs (competition). 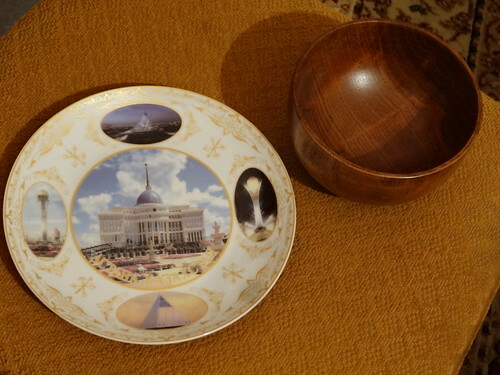 Turns out, I’ve just walked away from Kazakhstan’s central bank with a wooden bowl for koumiss (fermented mare’s milk), and a ceremonial plate celebrating the nation’s capital. This has me thinking about gifts: personal gifts, official gifts, and intercultural gifts. A fifteen year old girl’s painting, which I briefly admired at an art exhibition in the national library. I’m not sure she knows that I have it. A Mardi Gras mask from the masked ball at a local university. Lots of baursak (fried bread) and tea. A scarf and Russian novel from my British housemates. A stripy Where’s Waldo scarf from my local housemates. Holy water and a crucifix from Jerusalem, given to me by my friend’s Muslim mother. A postcard of a Muslim mosque in Cyprus, from my local Christian friend. Multi-level marketing toothpaste and deodorant, for curing heel pains. Jangly earrings, bracelets, and necklaces. Scarves. Lots of scarves. A leather bracelet from a man who asked if I was single in Turkistan. A dombira from my host family in Mongolia. Painting classes from the kind professors’ wives at the university. A miniature statue of the Bayterek, Kazakhstan’s national monument. Meals, many meals of beshbarmak (sheep meat and noodles). A teapot and teacup set labeled ‘Kazakhstan’. A bag for feast gifts (toibastar) with XL man’s cap inside. A linen table spread from an imam at a local shrine. And care packages! How can I forget apples sent from my housemate’s mother, or the candy and jewelry pliers my mother sends from America? Looking back on this, I find that gifts feel different in Kazakhstan. I suspect that’s because I’m in a different position. Today at the competition, I stood in line with young men in embroidered vests, sang a song, then gave a nice little speech on how I’d learned Kazakh and work with children every day and love the Kazakh language and isn’t it wonderful? The reward was a plate. I wasn’t the guest of honor– that fell to the silver-haired New Yorker sitting across the hall. The speaker apologized to me, mid-gift-giving: “You understand that age comes first,” she said, as she gives a gift first to the elderly American and then to I. “But of course we honor you for speaking Kazakh.” Someone snaps a picture. This honor thing – I have more as second-string to an English teacher here, than I ever would at home. So I see two sides to the hospitality we find in Kazakhstan. 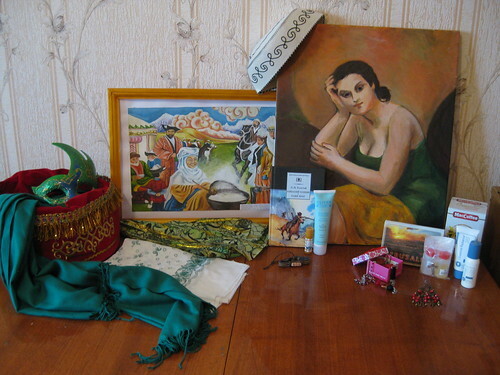 The first is the way Kazakhs see themselves as a nation– we’re a hospitable people, they say as they hand out gifts. 130 nationalities live together in peace, the speaker says, celebrating and pushing us into trilingualism. We experience hospitality because our hosts value being hospitable, as a part of who they say they are. But we also experience hospitality from our own position. A position of relative privilege, as white Americans. Hospitality is a social relation, which means that it changes in different contexts, whether from country to country, or even from feast to feast and workplace to workplace. Hospitality involves all of us: the giver and the receiver, and of course the gift. It has me thinking a bit about anthropologist Cynthia Werner’s work. 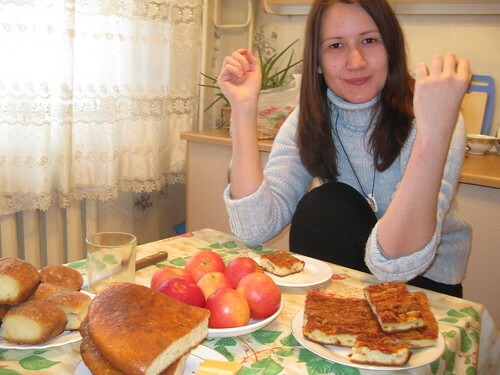 At the bottom of her website, you’ll see articles on Kazakhs feasting and gift exchange. And obviously, there’s also Marcel Mauss’ The Gift, if you want a classic look at what gifts mean and do.